Movie Review: The mischaracterized “White Gate”, directed by the veteran Nicolae Margineanu, was supported by true events in order to examine the fates of three Romanian youngsters who, in a desperate attempt to flee the communist regime of their country, resolve to swim across the Danube. The year is 1949, and the unhesitating carpenter, Ninel, was the one who came up with the idea, persuading the siblings Adrian and Anuca to follow him. On the shore, behind tall vegetation, ravenous mosquitoes bite them while they wait for the dusk to sneak into the water. Halfway, they were spotted by a patrol boat and told to surrender, facing the possibility of being shot dead. 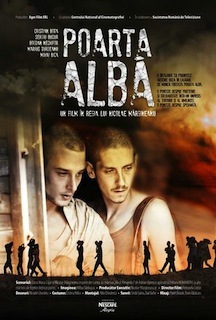 Adrian and Ninel are captured and taken to Poarta Alba (White Gate), a forced labor camp where they’re assigned to work in the construction of the Danube-Black Sea Canal, while Anuca disappears in the waters. The harsh working conditions of the camp supervised by ruthless criminals who had been promoted to brigadiers, drive them close to insanity. The film takes most of its time building the usual sadistic tortures inflicted to the undisciplined workers, together with the negligence of the communist authorities in regard to illness and exhaustion. Margineanu presents all of this in a classic black-and-white that tries to recreate the period when the events took place. At the beginning, a briefly colored scene introduces religious components into the story, when we are told that a fresco, exhibiting Baby Jesus wearing a typical labor-camp vestment, was found in a Bucharest church. This aspect is reinforced, but not totally succeeded, with the presence of an inscrutable monk among the inmates. Another character that is given prominence but fails to engage is Petre, a poet who can’t refrain himself from writing ‘forbidden’ poetry. This historical illustration assuredly condemns the vile regime and honors its victims, however, the trite approach, elementary production values, and impersonal execution, shove it into delicate territory.